Any good camera will do. One gets so close to the wildlife that even a good compact camera will achieve fantastic shots. However, if you want flexibility and the opportunity of capturing that really fantastic shot then any good quality digital or 35mm SLR (single lens reflex, as opposes to a compact camera with automatic controls) camera body will be needed. There are many models and makes to look at, but it’s important that the camera shoots at least five frames per second so that you do not miss the action. With a compact camera there is a slight delay between pushing the trigger and the shot being captured; whereas a SLR is instant. Some of the new Nikon SLR cameras offer excellent low-light capabilities giving you more opportunities when the light begins to fade. You will get extremely close to wildlife so it is not necessary to have huge lenses. A good zoom lens is your best option and will offer best flexibility. Fast lenses with an F stop of F4 through to F2.8 are best. Great all purpose lenses in this range are the 70-200mm f2.8, 200-400 f4 or 100-400 f5.6 lenses. With both these lenses you will have plenty on lens at all times and enough speed to keep your image nice and sharp. Most SLR bodies come with a standard lens; otherwise a lens with a 24-70mm range would be ideal to take landscape shots and general travel/ people shots. These are lenses that have a fixed length starting from 200mm and going up to 600mm. These are excellent lenses but very expensive and not always necessary. These lenses are wonderful in low light conditions, are very fast and offer great abrasion/shallow depths of fields giving your portrait shot that sharp look with a blurred background. However, they do tend to be heavy and need to be shot on a tripod or support of some kind. Put in a 1.4 or 2 x converter if you can. It’s always worth having and gives your lens that little more if you realty need it or if you want to take photos of birds. In order to get that sharp image, you need to make sure that you are shooting as fast as you can in the light offered, and most importantly you need to make sure your camera and lens are as stable as you can make them. All Sabi Sabi open safari vehicles have large steel roll bars in front of each seat. The easiest way to get stability is using a G-clamp directly onto the bar with a good quality head. Any good ball head or video head will work. The wimberly head is one of the best and very effective, if expensive. The lodges are able to supply a G clamp and Manfrotto 501hdv head on request for a small daily hiring charge. This Head and clamp works really well especially with the bigger lenses. A tripod is not usable on the open safari vehicle itself. You will not have enough room to adjust the legs and will not get enough stability. However, in and around the lodge or for that perfect sunset shot, you could use a tripod. A monopod is very popular and works well, using the floor of the open safari vehicle as a base. It is still advisable to put a movable head on the end of the mono. An old favourite, the bean bag, works very well. They are easy to use and offer lots of support. The down side is that they tend to be heavy. Don’t worry about bringing the filling along, as this is too heavy. The lodge will gladly offer you rice to fill the bag for your stay. Out of interest, bird seed works really well, its very light and settles well plus you can use some of the filling to feed the birds. It’s important to have a good flash. A third of the evening safari is at night and in near total darkness. Having a good flash or speedlight will certainly help in these conditions. There is no problem with the use of flash at all during our safaris and we would only ask for flashes not to be used when the big cats are actively hunting. Each open safari vehicle will have a tracker and he operates a powerful spotlight. One can easily take photos using this light as your only light source – it often creates a lovely effect! The African bush is a dusty place so it would be a good idea to keep your camera in a bag that seals while you are on safari. 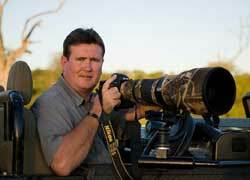 It’s also a good idea to not change lenses while out on safari. This will help to prevent your digital sensor being contaminated by dust particles. Bring a lot of memory with you – either a hard drive or lots of cards. There is no facility at the lodge to purchase cards and there is no way of downloading your cards either. So bring a laptop, hardrive or enough memory to last the full stay. I always take more than I expect to use. On a good safari I can easily fill up 8 gigs of memory. The more you shoot the more chance you have of getting that prize shot. On your arrival let it be known that you enjoy photography and are interested in getting some great shots. While all our Rangers are well trained in the art of photography some of the team have made it their passion so by letting us know we will try to make sure your guide can assist you. On each open safari vehicle there is three rows of seats, with each row a little higher than the one before. I always suggest taking the front row or even the seat next to the ranger. You want to be as low to the ground as possible. You will either be shooting over the bonnet or over the side of the vehicle so set yourself up accordingly. If you are new to photography and your camera is new then I suggest keeping your camera on “Program” this is normally a P on most top end cameras. Make sure your Auto Focus is on and your image stability if your lens has such a function. However if you understand a little more about photography and are confident with your camera I suggest the following: Always shoot in RAW – this is so important I can’t stress it enough. Granted, it uses up lots of memory but this could be the shot of a lifetime and if it is shot on RAW you have so much more flexibly when it comes to processing the shot. For your portrait shot and landscape shots always use “Aperture Priority” this lets you choose the Aperture and the camera will automatically select the camera speed for you. By doing this you can control your depth of field. In general keep the Aperture on F6.3 and F7.1. This will make sure that your entire portrait is in focus. But beware make sure that you are getting enough speed especially when the light starts to fade. Rule of thumb is that your speed should never be below the length of your lens. For example: if you are using a 200mm lens you should never shoot below 1/200th of a second or you risk camera shake. To prevent this happening especially when the light is low do not hesitate to use a much higher ISO. On most of the new cameras you can easily take the ISO up to 1000 without the image being too grainy. I personally will keep my camera set on f7.1 and ISO 400 achieving speeds of 1/1600 to 1/2000 during the day and pushing my ISO up to 800 in the early morning and late afternoon and even at times taking this up to ISO 1200. Remember the more speed you can get the better chance of the image being sharp. If you plan to try and shoot lots of action shots then “Speed Priority” is a must. To freeze a shot you would set a speed of at least 1/1600 and up, the camera will automatically set your aperture. Again be aware that your aperture is not falling too low if it is pushing up your ISO again. Here I would probably leave my camera on ISO 800 all the time. This would also ensure a lot of speed. Most of the newer cameras allow you to move your focus sensor square around manually on the frame. Do this and always make sure that you place the sensor on the eye of the animal where possible. A sharp eye always gives the image a much sharper look. If you use Canon I would set your camera compensation on 1/3rd over and 2/3rds over when shooting elephant and rhino. If you use Nikon I would set the camera compensation on 1/3 under exposed and on 0 when shooting darker animals like elephant and rhino. This will still allow you to get detail in the dark areas of the shot. Don’t always use your entire lens. While portrait shots with animals filling the screen are great, having an animal surrounded in its natural environment is sometimes even better. Make sure you place the animal in the bottom corner of the image and make sure that the animal is looking into the frame. This is called the principal of thirds. So the idea is to put your subject in one third of the frame normally the outside third. Try it – you will be amazed at the results. Other than that just shoot a lot of pictures and don’t be shy to fiddle around a bit with your settings. Often you will change a standard image into something very special. Rod, the company’s Managing Director, has been living at Sabi Sabi for the past 15 years and is an avid wildlife photographer. Rod is very involved in assisting a number of well know professionals from all over the world when they travel to Sabi Sabi and has a wealth of local knowledge that he is more than willing to share. He invites any guest wishing to know more to contact him on bushmanager@sabisabi.com or to contact him while at Sabi Sabi for any further assistance.